Alex has a glowing record of tennis achievements, one of which includes playing in the 2012 Australian Open Junior Singles Championships Main Draw at Melbourne Park. Excel Tennis Head Coach Marcus Petrou has coached Alex since he was 8yrs old and remains one of his biggest fans. With an enviable list of successes, Alex sports such titles as – No.1 in Australia for Under 12yrs Singles rankings and being in the top 8 in Australia in the Under 14yrs Singles rankings, while making the final of the National Hardcourt and Grasscourt Singles Championships. He has enjoyed some time competing through Europe playing ITF Junior Tournaments and lifting his World Junior ranking to 173. Alex has just finished his Year 12 studies and is ready to set out in 2013 for a big year of tennis in Europe! Chris is another success story from Excel Tennis Coaching. Since 8yrs old, he has trained under the watchful eye of Head Coach Marcus Petrou. 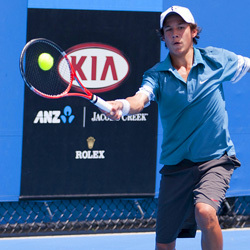 Chris can claim some impressive titles, including being in the Australian Open Junior Singles Championships Qualifying Draw for 2008 and 2009. Chris consistently achieved notable tennis wins, putting his ranking inside the top 3 in Australia in the Under 12yrs and Under 14yrs Singles rankings, before spending time overseas lifting his ITF World Junior ranking to 138. 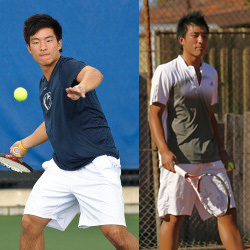 Excel Tennis is very proud of Chris who is currently on a tennis scholarship at Penn State in America. We applaud Jai for a great year of achievement. 2012 has seen him attain the position of No.2 in Victoria and No.11 in Australia for the Under 18yrs Singles rankings while completing his Year 12 studies. Jai’s coached by Excel Tennis Head Coach Marcus Petrou and has enjoyed a series of tennis triumphs in his road to the top. Most notably, he has won the Victorian Hardcourt Singles and Doubles Championships and represented Australia in the International Sports Federation World Schools Tennis Championships in Belgium, where Australia placed third. 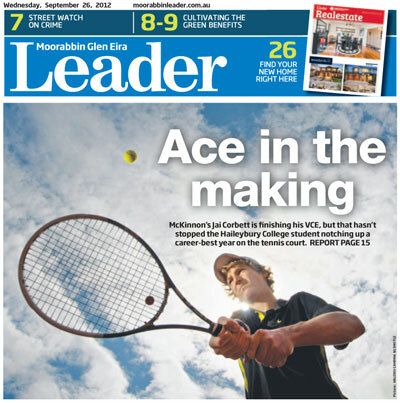 We are very proud of Jai’s achievements and we were delighted to see acknowledgement of his successes in the Leader Newspaper and on the Tennis Victoria website. Please read the articles below. Jai Corbett (McKinnon) is about to finish Year 12, but that hasn’t halted a career-best year on the tennis court. Once he graduates, Corbett plans to join a college in America and pursue a professional career. 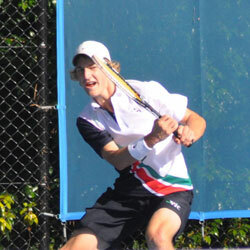 Currently ranked 106 in Australia, Corbett has been juggling tennis and schooling commitments for the last few months. “Yeah it’s pretty tough. I’ve had to cut back on a few training sessions to try and do my best at school but whenever there is spare time, I am doing something for tennis,” said Corbett. He is currently the second-ranked player in Victoria for the 1994 birth year. His ranking has jumped over 100 spots since the beginning of the year thanks to some impressive results including a semifinal appearance at last month’s 2012 TCAV AMT Platinum event. Corbett’s coach Marcus Petrou said his “hard work and dedication” was starting to pay off. “He has a good head on his shoulders and a hard working attitude,” said Petrou. Corbett started playing tennis when he was six and said he was still looking at ways to improve. “I’d like to base my game around how solid [Novak] Djokovic is from the back of the court,” said Corbett. “He has an all round game that I want to have. “I am trying to focus on the best parts of many different players,” he added. Corbett recently captained the Victorian 2012 Pizzey Cup team to third in the nation-wide competition.